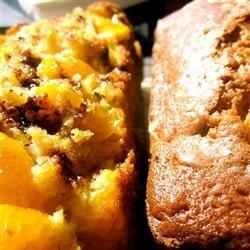 "Rich and hearty fruit bread, appropriate for breakfast, brunch or just a snack. My in-laws gobbled it up for Thanksgiving!" Preheat the oven to 350 degrees F (175 degrees C). Grease two 8x4 inch loaf pans. In a large bowl, stir together the flour, baking powder, baking soda, salt, and white sugar. Mix in the melted butter until the mixture looks crumbly. Stir in the cranberries and oranges. In a separate bowl or large measuring cup, whisk together the eggs, milk, sour cream, vanilla and orange extract. Pour the liquid ingredients into the bowl with the dry ingredients and stir just until blended. Divide the batter evenly between the prepared pans. Bake in the preheated oven until a toothpick inserted into the crown comes out clean, about 40 minutes. Cool in the pans for a while, then remove from the pans and place on wire racks to cool completely.